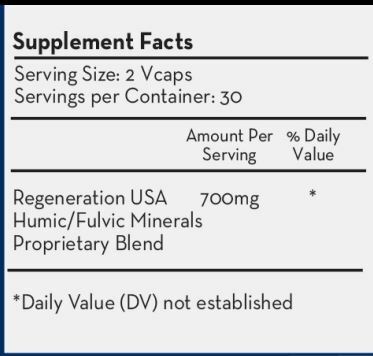 What are Humic and Fulvic minerals? Humic and Fulvic minerals are crucial to the maintenance of health and strengthen our immune system. These important elements are ancient complex plant derived micronutrients. They originated millions of years ago when the Earth was rich with plant life. During this time, the earth's mineral-rich soils produced a profusion of lush green forests and succulent fruits and vegetables, full of vital minerals our bodies need. Unfortunately, due to unsustainable farming practices, we no longer receive sufficient amounts of these life-giving nutrients in our food. Supplementation is therefore required to maintain the optimal amounts required by the body for good health. Humic and Fulvic minerals assist in regulating key metabolic functions while strengthening our immune system at the cellular level. A strong immune system has a better chance of fighting off pathogens that attempt to invade our cells and create illness. Humic and Fulvic minerals help carry nutrients into and waste products away from cells, while also neutralizing toxins and invaders. They can rid the body of heavy metals, radiation and other toxic pollutants. These pH-balancing minerals prepare the body's cells to receive other vital nutrients. In fact, Humic and Fulvic minerals are so powerful that one single molecule is capable of carrying sixty or more minerals and trace elements into the cells. Improved nutrition may translate into less food cravings and a healthier metabolism. In the East, Fulvic minerals are known as the 'miracle molecule' for their healing properties, ability to regenerate cells and restore lost youthfulness and energy. They are potent anti-oxidants and electrolytes that hydrate the cells naturally! Whereas colloidal minerals are too large to pass readily through the cell membrane, Humic and Fulvic minerals are directly absorbed into cells on contact. RegenaLife's Humic and Fulvic mineral range of products is a concentrated and balanced form of more than 72 life-giving ionic minerals. It includes all 17 essential minerals that the human body needs to thrive but cannot manufacture on its own. All minerals are NOT created equal. Our Humic and Fulvic mineral range of products is plant-based, whereas minerals sourced from rocks, shells and clay are not in the plant-based form the body needs, and therefore not as bio-available. It is taken from remote, untainted soil in New Mexico, USA – an area considered by scientists to be the best source of Humic and Fulvic minerals available! RegenaLife's Humic and Fulvic mineral range is 100% safe and natural, and independently verified to be free of synthetic chemicals. It is cold-water extracted, rather than using heat, acid or other harsh synthetic chemicals to mine the minerals. This results in a pure and potent product with no after-taste! Due to the product's natural mineral content, along with our effective processing methods, the product is naturally preserved and does not lose potency over time. This product contains NO genetically modified organisms (GMOs), toxic heavy metals, synthetic chemicals, or artificial flavorings or preservatives; NO gluten, corn, soy, peanuts, tree nuts, dairy, eggs, yeast, caffeine, shellfish, and sweeteners. Calcium: Well known essential mineral for building critical muscle mass, healthy hearts, and strong bones. Chloride: Works with electrolytes to maintain fluid balance, and produces balanced amounts of acid in your stomach. Cobalt: Also known as vitamin B12; instrumental in blood cell production, nerve support, and a host of other benefits. Copper: Copper is a critical part of many enzymes the body needs to function at full capacity. Iron: Protein may build the muscles, but iron makes the protein work. Iron is one of the most essential of all minerals in the body. Magnesium: Required for strong bones, healthy hearts, as well as chelating and removing of toxins. Manganese: Imparts energy, helps build strong bones, and assists with the functioning of the reproductive and nervous systems. Molybdenum: Required for many significant processes in the body, such as iron utilization. Nickel: An ultra-trace mineral and a B vitamin co-factor. Phosphorus: Helps the body create energy and stamina, and assists in a wide array of other functions. Potassium: Extremely important in keeping the electrolyte count balanced. Selenium: This mineral is the ultimate enabler of antioxidant enzymes in the human body. Sodium: An important electrolyte that works hand in hand with potassium. Sulfur: A critical element working synergistically with certain amino acids in the body. Zinc: One of the most important minerals, it is well known for its immune-boosting properties.